biokleen Premium Plus Laundry Powder 5lb box. 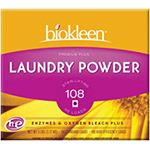 Home > Natural / Organic Products > Natural Household Cleaning Products > biokleen Premium Plus Laundry Powder 5lb box. Stain-Lifting Enzyme Formula: Our Premium Plus Laundry Powder with Enzymatic Stain Lifters and Oxygen Bleach doubles the cleaning power to remove the toughest stains and odors. Rinses free of soap residue and hard water deposits, a primary cause of skin irritation and diaper rash. Tough on dirt, Gentle on the Earth DOUBLE THE CLEANING POWER with biokleen's Premium Plus Laundry Powder. Safely whitens and brightens with natural Oxygen Bleach, Grapefruit Seed and Orange Peel Extract, natural water conditioners, and natural protein digesters. A powderful laundry cleaner and deodorizer without added, harmful ingredients. Gentle and safe enough for most delicate washables, including cloth diapers; leaves no irritating residue or odors behind.